All features and great support is included on each plan. 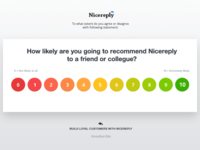 Nicereply helps hundreds of teams at companies like Microsoft, Lenovo, Hubspot and Buffer to measure and improve the quality of their customer service. Measure CSAT, NPS and CES 2.0 per agent, team or company-wide. Increase your survey response rates by 200%. See your data in your support software and set triggers based on it. Get 3x more feedback while sending less emails. Customize both the look and content of your surveys. Set goals, track KPIs, generate reports and more. Pros: It's a great assessment tool and it provides valuable metrics for management about performance. The UI dashboard is very simple and easy to use. I like the sample options and date range features included on the dashboard and that each NR is hyperlinked for direct access. This might be totally unrelated, but I enjoy the customer service articles NR sends to my inbox. I find them applicable to my current role. Cons: I really dislike the fact that customers can rate the same case multiple times, this is one the MAJOR downsides of NR. When customers are irate or it's simply something that is out of our control, they will use this to mark the agent with negative ratings (sometimes multiple times). Luckily, management reviews the agents NR rating and can determine whether or not the unfair score should be deleted. It's a bummer that NR isn't integrated with social customer service software such as Conversocial. Overall: Ensure the happiness of customers and how well the staff is responding to them by addressing their concerns and questions. Also, it helps us to identify trends and issues. Pros: I like being able to see feedback and rating from customers who rate us based on our service. It is nice to see that they can rate the service and the product separately. It has lots of potential for being a great product for companies. I am excited to see this evolve and grow over time. Cons: I hate that customers do not understand the ratings and decide to ask more questions in the Nicereply rating comment box rather than in the actual email they sent to our help desk. I also dislike how a single "1" drags mu scores down when it is for things such as a customer being unhappy with something we don't offer. They like the service they got but end up rating me as a 1 and then it looks like I am not effective. It gets frustrating at times but I guess it is just part of the job and is something that will be tweaked over time. Overall: Great way to assess and keep track of Support team effectiveness. Great addition to our team! Pros: My favorite feature is allowing us to click on the ticket that the user has responded to - other applications n the past didn't allow us to see the ticket in which the user is commenting on. It allows you to see where some may be struggling and where others are excelling - helping teams come together and make a better user experience all-around. Cons: I wish NiceReply could be built into Zendesk so we would see it at a quick glance rather than having to log into NiceReply separately. Not too many dislikes on my end other than needing to log in separately and taking time to go back into a ticket to see what the comments/rates are in reference to. 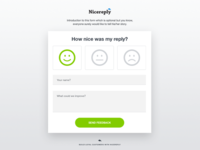 Overall: NiceReply's platform allows you to see where exactly a user may be lacking, how users are responding to customers, if there's a common problem area, and also the opposite / where users seem to be excelling and how others could adopt that workflow. It's easy to use and review my team's ratings daily or periodically. Pros: Actually I only used nicereply for less than 2 months since I joined a new company. It's quick and easy to use for a startup company which is not able to devote a lot of resource in developing a software of itself for evaluating the customer service's work from customer's viewpoint. Cons: I just have some suggestions for nicereply. First, I have three CS teams and if I want to view the scores of each team, I have to output the csv datasheet to deal with it. If I can set it on nicereply and view the team's score directly on nicereply, it would be better. Second I can not understand the calculating of the average score. For instance, If I have 6 agents in a team(team 1), their score is 9, 7, 6,1,1,1, then the average score of this team is 4.17, but if I have 4 agents in another team(team 2), their score is 9.7,6,1, then the average score of that team is 5.75. So if 3 agents get 1 score respectively( that is the case in team 1), and if an agent get 1 score( average score for 3 ratings), then the average of the team is totally different, but the only difference is that the 1 score from 3 replies of one agent and 1 score from 3 replies of three agents. I don't understand why. If nicereply can suggest a better way of calculating the average score of a team, that would be perfect. Great for getting additional feedback from customers! Pros: We are able to access additional feedback from customers who aren't particularly internet savvy and think they're emailing us (we get the full message!). Plus, when you have customers who are ecstatic, you get to review their feedback as well! Great for encouraging your staff. Cons: Not so much a dislike about the software as it is a mild frustration on not being able to remove negative feedback from the overall score when it had nothing to do with the situation (i.e. rating of 1, reason: my street was flooded and the mailman refused to delivery my package anyway). Overall: A better idea of where customers stand and what adjustments to make to further enhance our reputation, image, and quality of service (not listed in order of importance). Overall: We have been using Nicereply within our team for more than 4 years, especially the CSAT function. If you are looking for user-friendy solution for getting rated from your customers, NR is the best you can choose. Excellent Product! Very Easy to Use! 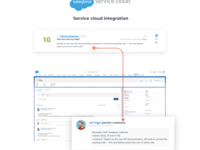 Pros: As a Customer Support Agent this platform allows me to see how I am doing overall, look for trends and the best part is that I can click on the review and it links to the case I worked in Salesforce. My manager can also see how I am doing and how my team is doing overall. The charts, numbers and colors all make it very easy to use and super clear to read and understand. Cons: The customer is able to leave multiple reviews for the same case. For example if a customer is unhappy about something that is out of my control, such as a product or policy issue, they will continuously hit the "1" or "sad face" and it drops down my average when I get several of those in a row. I would like to see NiceReply put something in place that will prevent the same customer from being able to review more than once! NiceReply has been our go-to for CS ratings for years. The UI uncomplicated and easy to use. Pros: We chose and stuck with NiceReply because it is so simple to use, the metrics are easy to understand, and the UI is clean and uncomplicated. It required ZERO additional support to implement, and I've never come across a bug or glitch. For a busy Director of CS, these are imperative and greatly appreciated. Cons: I would like for additional customer information to be included in the rating emails that arrive to the agent's inbox. It "may" be easier to remediate poor ratings, but it's not a deal breaker by any means. Overall: This software allows me to monitor the quality of CS agent communications without auditing ticket by ticket. It's fast, informative, and easy to use. Does exactly what i need it to do! Pros: Gives our customers a chance to leave feedback that they otherwise wouldn't think about leaving. We get another chance to respond to their comments and concerns with a rating they provide. Cons: Haven't had to engage support for any concerns, so not sure how well that would be. This may have more to do with our implementation but we have customers responding to NiceReply with information that they should provide to our support staff, thus confusion regarding "where do I leave comments if issues unresolved?" Nicereply has been helpful to get a glimpse of how well we are servicing our customers. Pros: It's nice to see how a customer feels after you've been able to help them, even if they do not reply back to you via email since you solved their problem. They seem to be more open and honest about their experience. Cons: Sometimes it is not obvious for customers when they provide feedback. Occasionally I will see a 1 star review, but they mention positive feedback so it is obvious they had intended to give 5 stars instead. If there is a scale already stating 1 star is low, then perhaps it could be more obvious (we also have international customers in other languages). There are also times where customers respond to my emails through Nicereply rather than the actual email. I receive an email notice when a customer provides a rating on Nicereply. Although it shows where the customer is located, it would be nice to see the actual ZenDesk email message so I can quickly see what it is in reference to, rather than having to open up the ticket in another window tab. 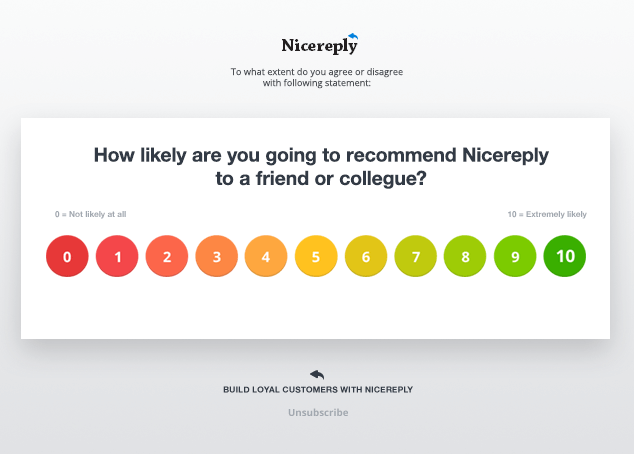 Nicereply does exactly what it needs too: deliver ratings and statements from email Customers. Pros: Nicereply knows what its good at and doesn't focus on anything else. The UI is intuitive, basic and helpful. This is a true "meat and potatoes" tool. It provides our team a pulse on our email support and customer contacts. Cons: As stated previously, Nicereply only does one thing, albeit well. It fulfills its purpose but doesn't bring anything new or cutting edge to the table. You know what you get, the whole time. Overall: Nicereply provides our team with an immediate understanding of a customer's view of their service. It also allows us to keep our eye on any customers that require additional attention or feel that their service or product experience is incomplete. Very useful and easy to use tool with clean and intuitive interface. Pros: Their Admin side is easy to navigate, and trend charts help me track customer feedback easily. 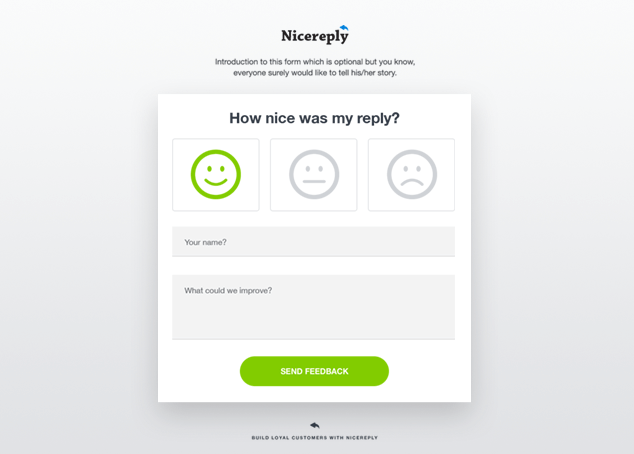 Our customers report NiceReply as easy to use, and are happy to have a channel to submit feedback! Cons: Not much to complain about - but one thing that might be good is having the 1-5-10 rating option appear with different options than the smile/neutral/frown. Our customers sometimes mistake the neutral face as meaning a neutral experience, when 5 is considered a poor rating. Overall: We gain great insight regarding our customers' experience with our software, support representatives, and business as a whole. Keeps you in the know! Pros: I love nice reply because it always helps you see where your customers are enjoying your support and when they are not. Additionally, you can also see how your employees are handling interactions with your customers so that you can train those who need a little extra training or praise those who are going above and beyond for our customers! Cons: i do not think there is anything that i dislike of nice reply. They have always provided the support i need when i needed it and its an all around great product that i would definitely recommend. Pros: When I help out a customer which I do most of the time they like with I have said and give me a 10 for a review most of the time. This also goes to my manager which in turn makes me look good. However this can be a double edged sword. Cons: When I have to give customers bad news or info they they don't like but I have no control over they give me a rating of 1 even if it's no fault of mine I am the message and take the brunt of there anger with the bad review. Overall: it makes it nice to show my boss that I am doing well and that our customers do appreciate what I do. Good idea in theory, but misses the mark when it comes to overall functionality. Pros: It was fairly easy to set up and get running. The supplied good write-ups for getting things installed and connected to things like Zendesk. The graphs are easy to just copy-paste the code and it looks pretty nice. Cons: If you make a mistake when setting up your reviewing, you have to start from the beginning to fix that mistake, you can't just fix it. I ever reached out to support for help but, after several days of no response, I ended up just deleting all the work I did and starting over from scratch. Only then I heard back from support and they essentially told me to do just that. Pros: Easy to read results, easy for customer usability. I like seeing that the customers can rate both the service and the product. I am excited to see this evolve and grow over time. Cons: I don't like that our customers do not always use the rating system correctly, and will reply within the NR comment box instead of the actual thread. I also don't like when I am rated a lower score that it will bring my overall score down when the customer is rating me for a policy, rather than my own effectiveness as an employee. Makes it easy for us to get outside opinion on our support. We use it for our quality program. Pros: Ease of use of the API to integrate with our other tools. This makes it easy for our support reps to see their scores as they come in. Also allows us to send different kinds of customer surveys depending on the kind of data we need to get. Cons: Could have a nicer app interface but we don't need to interact with it much. Also allows for duplicate ratings to be submitted. This means we need to spend time deleting them. Would be nice if there was a mechanism to prevent duplicates. NiceReply allows us to take a real pulse on our customers who reach out to our Support team. Pros: I like that NiceReply gives our users the opportunity to post a comment about their service. That allows us to dig deeper into ticket that don't go well and make improvements, or take a closer look at what we're doing right and grow from there. I enjoy the comprehensive feedback from our merchants for both CSAT and CES - great tool! Pros: NiceReply really helps us to identify any merchant problems and provide clear solution, this tool is really effective in my job along with our team and evaluate our performance weekly - so far love NiceReply tool! Cons: Maybe more options or perks or awards - also sometimes I notice wrong rating will still apply to me after transfer case to other person - maybe need little improvements to fix issues. Pros: The one thing that sticks out to me about this company is that when we first started with them we did not exactly fit the mold that we wanted to use Nicereply for. When I spoke to someone there they told me what I was looking for was actually in development and they allowed me to stay on a trial and kept me updated on the progress of the development that I needed. That showed me they valued not only the customer but had faith that their product was going to fit our needs. Cons: I do not have any con's at this time. Every time I have reached out to customer support I get top notch service. Has worked nicely for us. Pros: The ease of use for my team for individual score tracking, simplicity for me managing the overall scores, and simple operations for the customers when leaving ratings and comments. Cons: When we receive a negative score, we research which customer it came from so that we can try and remedy it. There is not always enough information on the review we receive to do this. That would be helpful. Overall: Helps with our team's customer service efficiency and development. 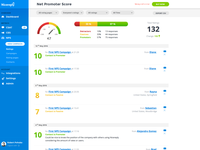 Pros: It updates quickly, and is able to give us the metrics we need to better understand how our clients feel about the support representatives. Cons: There isn't really much to dislike, other than there is no way we have been able to find that allows partial numbers, such as 5.5 or 7.5, only full integers. It may be a setting that we haven't seen, but it would be useful. Overall: We're able to better judge how effective support members are now with the system, as the clients will let us know how strong or poor their experience was. Previously we had to call clients to see how they felt their customer service was, and this prevents us from needing to contact them as such. Cons: It's really annoying how i'm unable to delete past users and retain the ratings but forced to disable them which doesn't do anything useful, the list of staff members is still full of interns and ex employees. Also once i disable these people, i can find a way to enable them back. Pros: I like that this is easy to use for both my growing team and for our customers. Feedback is a crucial metric for our team and without NiceReply we'd have a tougher time scaling our training on communication best practices. Cons: It's frustrating implementing the NiceReply snippet into our shared inbox (Front) signature. The snippet doesn't play nice with Gmail page breaks. I'm not entirely sure who this falls out. Additionally, some recent changes have made it difficult to identify the origin of the rating, taking away valuable information. Nicereply is a great tool for monitoring employees responses to customers. Pros: The software is very user friendly, and provides the information necessary to gauge how the team is doing right at your fingertips. Cons: There really aren't too many cons. If I had to pick one, it's the rating scale that is provided to our customers. It gives them an option of a smiley, neutral, or sad face. Not sure if this is a limit of the software or the ticketing system we integrate it with. Working with them for two years and enjoyed every min. Our users in 40% also The ease of Integration was impressive! Tal, thanks for your review. If you want to change icons in the email, it's possible to do. You need to upload your custom ones on the server and point to the icons in html rating snippet. Pros: I like most the ease of use for both implementations and for customers to provide feedback. It's a great service to offer your customers an easy way to tell you how you are doing. Cons: I wish it was a 5 star system instead of 10. 10 Stars confuse customers when 5 is the norm in most cases. Overall: It's not always easy to get positive feedback from customers and this service allows for that to happen easily. A great overall product has made interacting with our customer even easier. Pros: Has great features and their support is great and friendly. I have never had a problem with anything on here. Cons: none really. The software does everything we want it to do. In the past we had an issue with reviews being given to wrong people due to customer error, however, support was great in making sure we were able to reassign them! Overall: Customer feedback and interaction. It allows our customers to clearly and easily rate our service, which is invaluable. Pros: The clear stats we now have to track our mission as customer service. By connecting it to our Zendesk we always know where we stand with our own customers. Cons: Sometimes the automated emails can be a bit confusing to the less tech-savvy. It asks for a reply above the line which confuses some folks who don't realize you just simply reply to the email. Love NiceReply, so simple to use and great for keeping track of stats between reps!! Pros: I love that it easily shows your ranking between you and your peers. I'm able to see exactly where I stand. Also, it links up so easily with Zendesk, you can just click on the ticket number and it takes you right to the ticket you were reviewed on! Cons: To be honest, I don't have any complaints about NiceReply. It's such a simple and intuitive platform! Overall: I actually won an award with my company because NiceReply easily tracked my ratings compared to my coworkers and we were able to see I had the highest ranking among every other rep! Easy to use for us and our customers to gather feedback. Pros: The simplicity for our customers which leads to more contributions. The clean dashboard and reporting. Cons: More customizations for how we solicit feedback and the ability to leverage NiceReply for proactive email campaigns. 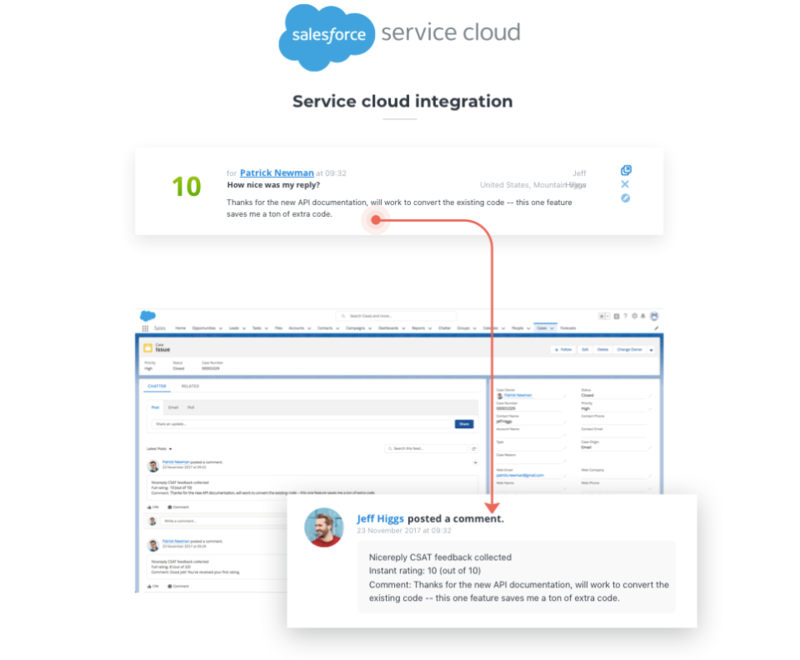 Better integration with Zendesk. Overall: It's our main source of information for CSAT metrics which is a large part of how we measure our team effectiveness. Pros: The charts for sure! And being able to see comments vs not comments. Its really good to see the ups and downs and then compare what you are doing now compared to the past. Cons: Not enough things to filter the reviews by. I dislike how its just a 1, 5, or a 10. I wish the person giving the review could choose any number between 1-10. Hi Don, thanks for your ratings. You can easily change the scale to 10 starts in the survey appearance settings. Feel free to reach us at contact@nicereply.com for any help. Easy to use interface, reliably gets the message to us from our customer base. Pros: I most like how simple the interface is and how it easily integrates with our ticketing systems. This pretty much ensures that we get a reliable stream of customer feedback. Cons: I believe the software works well, it is difficult to get consistent feedback from customers, even, or especially, when you are doing a good job! I have never had that problem with Nicereply. Overall: Consistent, reliable feedback on our service from our customers and partners, this is all facilitated smoothly by the easy to use nature of Nicereply. It is a simple tool, that allows us in our company to easily manage our customer satisfaction. Pros: I love that it's such an automated process! We're able to pull everyone's feedback into an easy CSV, sort, and restructure areas of opportunity! Overall: Ease of use, great reporting opportunities, weekly updates from the team! Nicereply allows our team to provide the best service possible. Pros: The ability for us to get almost instant feedback from our customers after an interaction, allows us to make on the fly adjustments and track trends with team members. And the helpful articles that explore effective customer service techniques. Cons: The dashboard could be a little bit more robust I think. I wish there were more metrics to compare and help us track more effectively. Overall: As a team member, it helps me track and make sure I am continuing to live our companies core values. Pros: The tool is helpful in finding trends in how our customer service agents respond. The site is easy to navigate, and I like that I'm able to check reviews for different groups of agents as well as different time frames. Cons: Some customers tend to leave multiple ratings, which can skew the average. The dropdown menu with agents' names used to be alphabetical, but now it's not which makes it hard for me to find a specific person and check their reviews. Overall: The reviews we receive from customers on Nicereply is really helpful in gauging how our agents respond and what policies work and don't work. It's great to receive many positive reviews, and we strive to improve practices based on feedback from negative reviews. NiceReply is a great metric tool for our business! Pros: We love how easy it is to integrate with existing support platforms. Currently, we use Front to handle client communications and support - NiceReply seamlessly integrates with Front and allows us to move hot button issues to the right person automatically, as well as nurture and collect more info on the happiest clients! Cons: Would love some more customization of each survey, and the ability to run specific surveys to specific customer groups. Currently, I find that NiceReply is a bit limited when it comes to look and feel of surveys. Being able to embed these within our product would be a huge plus as well! Pros: It is the best software you can find to react instantly to bad customer service experiences, only pressing a face (Bad face, normal face and happy face), you can understand how your customers feel about your services. Cons: For older people can be hard to understand how it works and sometimes when someone press a bad face by mistake you get a bad mark with no reason so it would be nice to ask before something like: Are you sure? O something similar to it. Pros: Questions can be customized with different rating systems, and customers are able to add additional commentary if needed. Cons: We are unable to customize the Nice Reply widget in emails with HTML for branding purposes. It would be great if this feature was available. Also, customers cannot chance their review after submitting. Once we have helped the customer and resolved their concerns, we would like for them to be able to change their review if necessary. 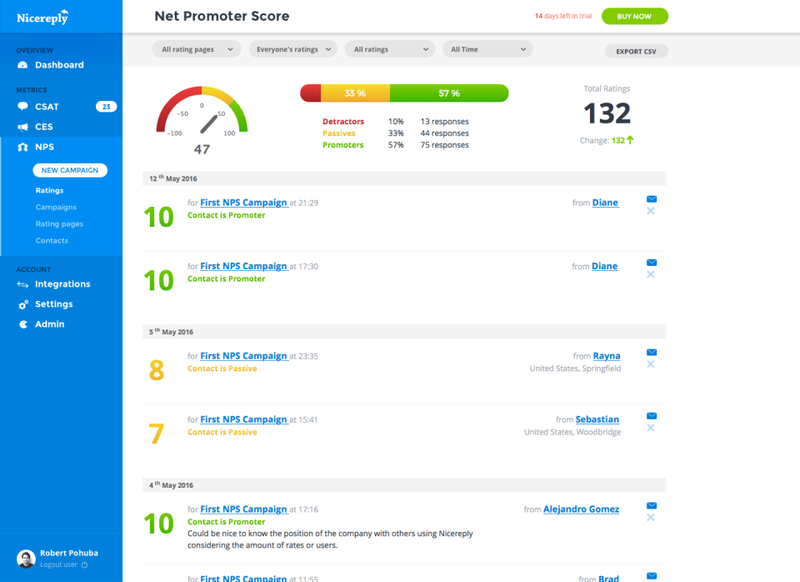 Excellent Customer Satisfaction, Customer Effort, and Net Promoter Score software! Pros: Nicereply is easy to use, easy to setup, and easy to integrate. The system is robust from a measurement standpoint and engaging for the user. The visual indicators of satisfaction, make it very easy for the user/customer to quickly rate service, effort, or opinion of our services. Cons: There is not much to not like about Nicereply. It's not a full featured survey platform, so I use a different product for things outside of its wheelhouse. Overall: Our survey responses increased by 50%. We were able to measure with a 10 point scale as opposed to a 2 point scale. Weekly reports are sent to me which ensures that I am pushing out the results to my Team. Best CSAT Survey Software on the Market! Pros: NiceReply is easy to setup and maintain. It integrates seamlessly with Zendesk, which has expanded our ability to measure our CSAT scores. It's a very affordable solution that includes a very pleasant interface for the survey respondent. Cons: There's not a lot to dislike about this software. It's been an excellent addition to our service desk. Overall: Our ticket system has a very limited native survey component which is essentially binary (Good or Bad). NiceReply has given us the ability to see how well our technicians perform on a scale of 1 to 10. In addition, we use three emojis to elicit a response to our survey which has improved overall completion rates. Always an easy way to track customer experiences, good or bad. Pros: The analytical data it provides helps coach and improve employees ability to offer great customer service. Cons: As with any review software, there are gaps in accuracy when the platform can be used to submit feedback that was not relevant to the experience the customer had with the employee. Nicereply is easy to use, the quality is good. I am not sure how it can be improved, its good! Pros: Ease of use, great data, accountability for our support team, gives a voice to our users. The system is easy to navigate and the data is easily accessible. BEST/easiest-to-use CRM software there is! Cons: there are very few things that can be listed as a con for this software. Pros: I like the proficiency of the program itself. You don't have to wait a week for results, but you receive notification as soon as someone leaves a review. Cons: I wish they would get of the excessive cookies embedded on the site. It causes security issues sometimes. Pros: It really is an all in one customer satisfaction survey tool which make its easy to capture your customer's satisfaction from different aspects. The dashboard allows you to see all pertinent statistics in one place which make comparison very easy. It also allows for creation of extremely professional looking surveys. Cons: Integrations with other softwares/ platforms are quite limited. Overall: We were tracking customer satisfaction using various methods which made analysis tedious. Having the various methods in one place solved this problem and allowed us a clearer view of where we stood in terms of our customer service.